Author(s): Katre, A. & Tozzi, A. The number of models of Decentralized Renewable Energy (DRE) systems, particularly for rural electrification, is growing globally. Most approaches to assess the sustainability of these solutions beyond simple techno-economic considerations are comparative in nature, and only allow us to evaluate performance within a set of other interventions. This leaves a gap in our understanding of the conditions for a specific model to be sustainable and whether its replication is likely to succeed. 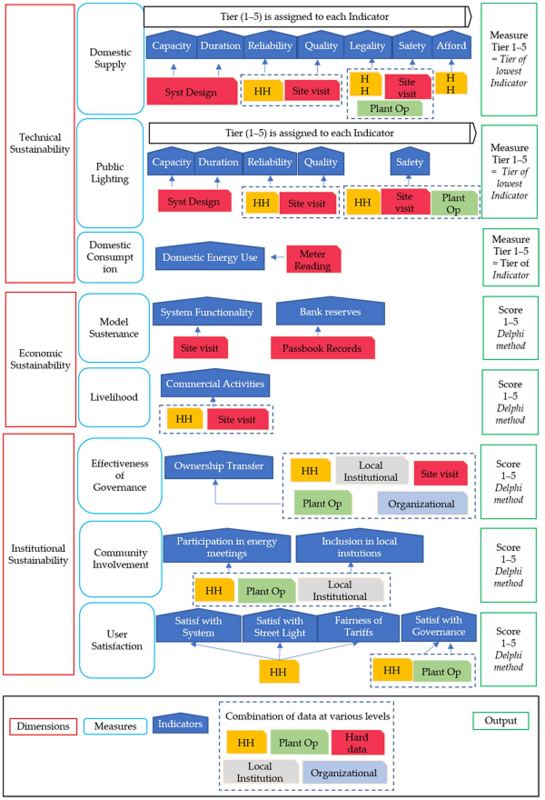 The approach suggested develops a framework to evaluate the sustainability of specific models for energy access individually and proposes analytical methods to illustrate its use. It combines the multi-dimensional analysis over five sustainability dimensions and the Multi-Tier Framework (MTF) to assess technical sustainability, extending MTF’s rigorous scoring methodology to the other dimensions. The scores are based on qualitative and quantitative data collected from key stakeholders, taking into account different perspectives and aims. The framework and analytical methods are exemplified using a subset of data collected in over 40 off-grid DRE systems utilizing a common community ownership and hybrid financial structure. The proposed methodology can be used to understand the sustainability conditions of a given approach to energy access and can therefore be used by practitioners and policy makers to develop strategies and guide policies to roll out effective solutions.